Source of title proper: Title based on title appearing on postcard. 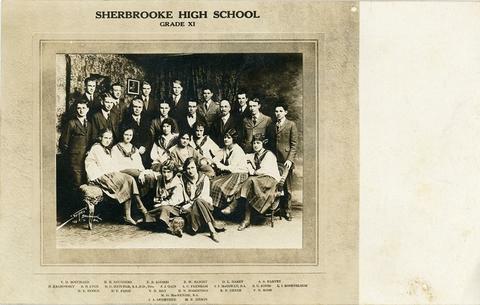 The item is a photo postcard of the Grade XI class at Sherbrooke High School from about 1922. Those pictured in the photograph are, left to right: (back row) V.D. Bouchard, H.E. Saunders, E.B. Loomis, R.W. Haight, D.L. Darey, A.S. Harvey, (third row) H. Khakowsky, B.D. Lyon, H.G. Hatcher (principal), S.J. Gain, A.C. Farnham, S.J. McGowan (B.A. ), E.C. Jones, L.I. Rosenbloom, (second row) B.E. Hodge, E.E. Paige, V.D. May, M.O. MacKenzie (B.A. ), H.N. Robertson, R.E. Genge, V.N. Bush, (front row) J.A. Oughtred, and M.E. Aitkin. Transferred from Bishop's University Archives in 2018.